I saw this book on NetGalley and instantly LOVED the cover. How gorgeous. Then the description pulled me into reading it. Billie Flannigan went out for a hike in the wilderness and never made it back home. Now a year later, her husband Jonathan and daughter Olive are having trouble adjusting to life without Billie and their new normal. Then Olive starts seeing her mother in hallucinations – is she psychic? – and is convinced that her mother is still alive. As Olive explores what might have become of her mother, Jonathan does some investigating of his own. Was his life with Billie what he thought it was? I should warn you right now: this is going to be another of my vague reviews. 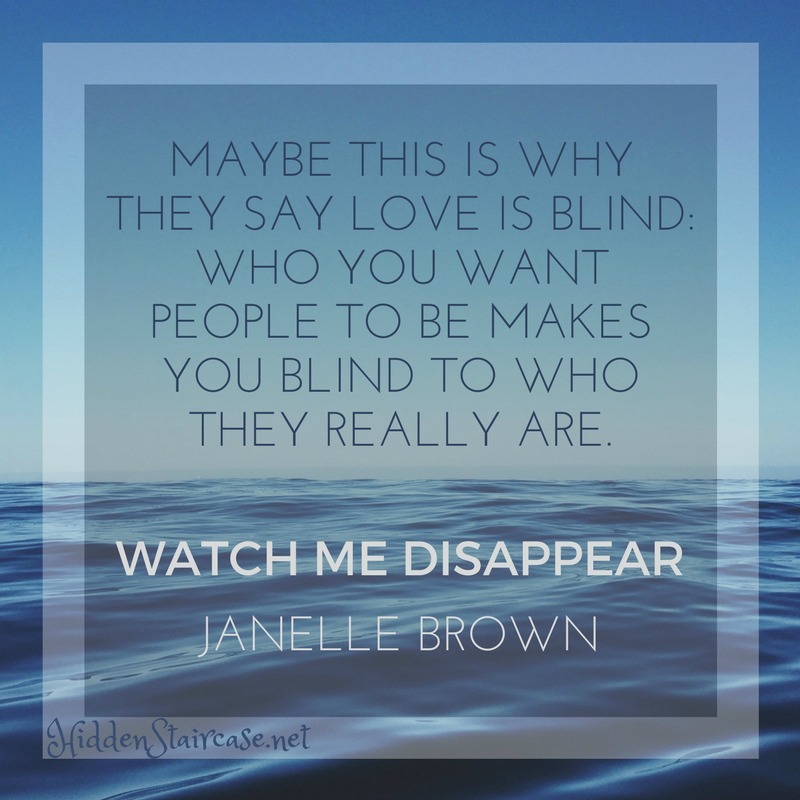 Watch Me Disappear is one of those novels where I just don’t want to say too much and give something away. The further you read, the more the onion peels back on Billie’s character, and the lies she told her family. Jonathan begins to wonder if Billie really died in those woods, or if she just left her family for good. The Billie he knew wouldn’t do that. But the new Billie he’s learning about just might. Watch Me Disappear is full of questions. Is Olive psychic? Who was Billie, really? Did Jonathan know her like he thought he did? And ultimately, what did happen to Billie that weekend when she ventured out on her own into the woods? At times maybe too many questions, but in the end they all worked together to tell the story. The biggest thing that didn’t work for me was the “psychic” piece. Jonathan is just getting ready to have Billie ruled as dead in court so he can collect on her much-needed life insurance. Olive’s visions begin and put her at odds with her father, kick-starting their own investigations; Olive looking into Billie’s disappearance, and Jonathan into Billie’s past. The visions did get the plot rolling, but I wasn’t convinced on that particular piece of this puzzle. One thing I really liked was the ending. Instead of leaving things ambiguous and the reader guessing, Ms. Brown does finish the story and let you know exactly what happened to Billie on that fateful hiking trip. Some readers may appreciate an ambiguous ending, but I like to have all my i’s dotted and t’s crossed, so the ending worked well for me. Overall this is a page-turner and a fun summer read. Glad to see you enjoyed this because I have it coming up soon. These kinds of books are always so hard to review to not give anything away! Great review!! I really liked this one. Billie is a complicated character and I liked the way she is slowly revealed. I hope you like it!